Buddha is depicted, his head circled by a halo, sitting beneath a dais, the form of which moulds the curve of the ogival panel. As the figure has lost its forearms it is impossible to determine the original gesture being made, but the incipient movement and the disposition of the robes would suggest that of the gesture of preaching (dharmacakra-mudra), or “turning of the wheel of Dharma”. Indeed, the general arrangement recalls a niche effect similar to Gandhara reliefs from Serindia and Northern China. While the modeling of the robes and the treatment of the hair are reminiscent of the Indian canon, the robes themselves display a Gandharian influence. The naturalistic treatment of the flat folds, and the zigzagging hang of the hem of the cloak echo the earliest Buddhist art in China as seen in Yungang. The figure is sculpted in wood, on which traces of a former polychrome decoration are still visible. On its back, the rough, cylindrical, cone-shaped carving reveals the technique employed. This tabernacle relief originally formed the central element of a triptych. It served as a portable altar, in other words a traveling religious monument. Moreover, a rectangular cavity suggests that the sculpture could be fixed onto a support. In the art of the oases, the theme is often found in painting and sculpture, as well as in embroidery. 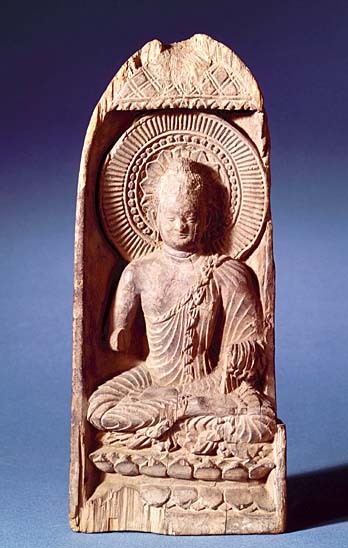 Although apparently displaying a conventional classicism, this image of Buddha in fact reveals the complexity of the interplay of Western and Oriental influences in Serindia; this was a consequence of the important network of exchanges operating in Asia around the 7th century. The Duldur-Aqûr site from which this piece comes was contemporary with that of Tumshuq, where major Buddhist centers on the Northern Silk Road had been established.